Originally from Vogue? Who know.. the internet is a complicated place full of borrowed pics. I have a story about these! I did them over the summer when my nails were particularly long. I was going through a period of Lana obsession (it happens every now and then) so I filed my nails bit pointy-er than normal. 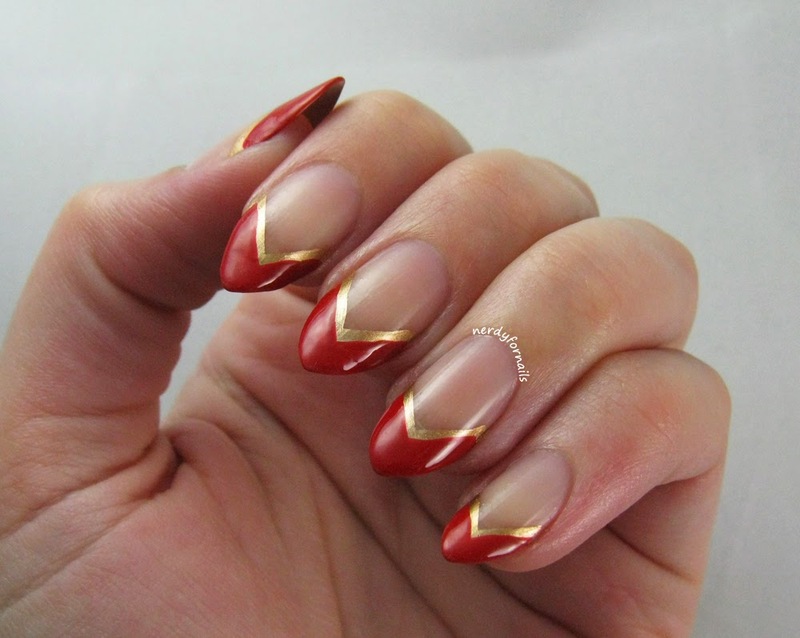 They're definitely not as pointy or as long and Lana's but they're my real nails which have a very real threshold for how long they'll allow themselves to be. In case you were wondering this is about a week over that threshold. I got a little tear in the corner of one while wearing this and despite several patch attempts I ended up having to cut them down soon after. Not to worry, they've fully recovered and are dangerously close to being too long again. These aren't exactly Christmas related, but this seemed like a good time to post them since red and gold can be very festive during the holidays. I started with basecoat then used Maybelline, Bold Gold to paint the tips gold. I used the bottle from the brush and free-handed the diagonals. 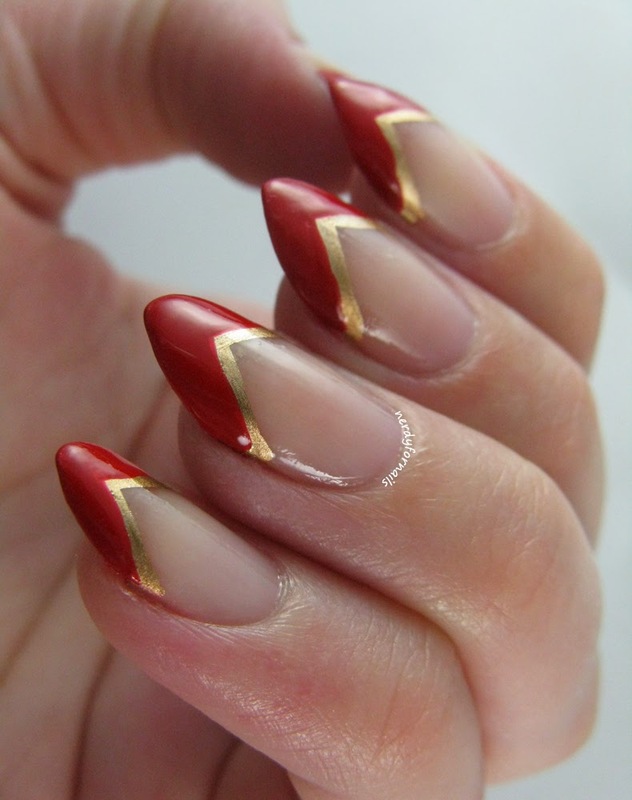 I went back over the tips with red polish leaving a stripe of gold showing. I don't even know what red this is anymore (that's what I get for waiting so long to post things). If I had to guess I'd say Red Red from Wet n Wild. This is pretty easy to do free hand if you're just starting out with nail art, but tape could also help with crisper lines. I love Lana's vintage nail style and of course the shape even though I can't pull off something quite that extreme myself. 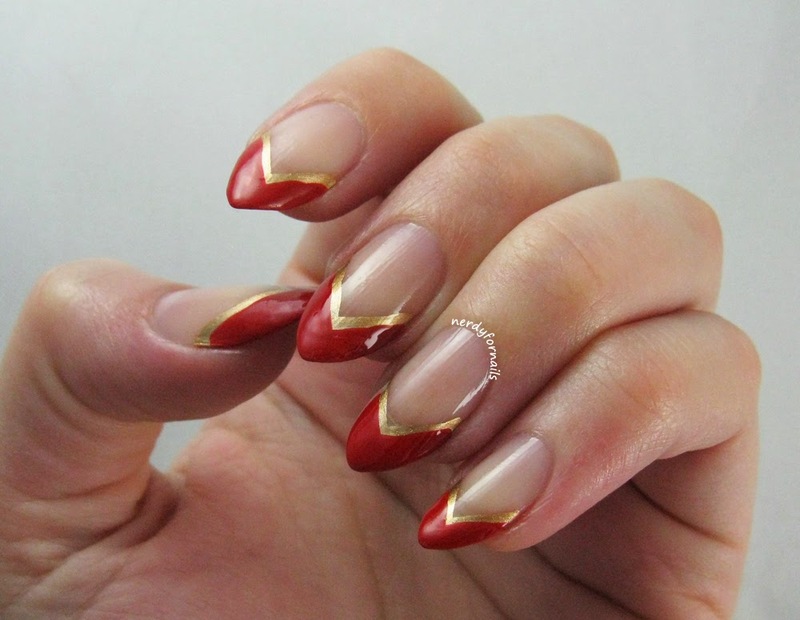 Do you have any favorite celebrity nails?